Avengers: Infinity War is just over a month away, and Marvel fans couldn't be more excited. With the second trailer still fresh on everyone's mind, some people just can't help but jump to conclusions about what we will see in the climactic team-up. One theory that many fans have been coming up with, however, might actually have a bit of truth to it. During all three trailers, we've seen a large, mysterious ring floating into the sky that has been confirmed as Thanos' Q-Ship, with Spider-Man holding onto it as it ascends into the air. This ring was seen in the most recent trailer, where it was shown crashing into the ruined landscape where we know a seriously large battle will take place between Thanos and Iron Man, Doctor Strange, Spider-Man and the Guardians of the Galaxy. The most mysterious factor regarding this ring, however, is Spider-Man's outfit. During the first trailer, Spider-Man is on this ring wearing the Iron Spider suit shown at the end of Spider-Man: Homecoming. In the Super Bowl trailer, however, he is on the ring wearing his regular Spidey-suit. This has brought one conclusion to many fans across the Internet, including myself: Time travel. The Marvel fan theory states that Spider-Man, Iron Man, Doctor Strange, and the Guardians will face Thanos in the ruined landscape, believed to be another planet. Unfortunately, this fight will not go as planned, and all of the heroes except Doctor Strange will perish. This also aligns with the San Diego Comic Con footage of Infinity War that showed a seemingly dying Peter Parker in this exact landscape, muttering an apology to Tony Stark. Then, in one of the establishing shots of the first trailer, we see Tony fighting back tears, holding the burned hand of who we can assume to be Peter from the Comic Con footage. Realizing that the heroes have failed, Doctor Strange will turn back time using the Time Stone to make sure that the heroes are properly prepared for the fight. The second time around, the heroes will know what they're up against, and Spider-Man specifically will dress accordingly. This will be the timeline where Spider-Man wears the Iron Spider suit on the ring, and where the team will presumably hold the upper hand in the fight against Thanos. This would be a great couple of scenes for Infinity War to have, as we already know that this fight will not be the climactic final battle of the film (Wakanda will be). By seeing all of our favorite heroes like Star Lord and Spider-Man be killed by the film's antagonist, only to come back, these scenes could set the tone for what Earth's Mightiest Heroes are up against. Additionally, the film will still manage to avoid the controversial mistake from Breaking Dawn Part 2 of having a bunch of cop-out deaths at the end of the film by having it take place toward the first half of the film instead. 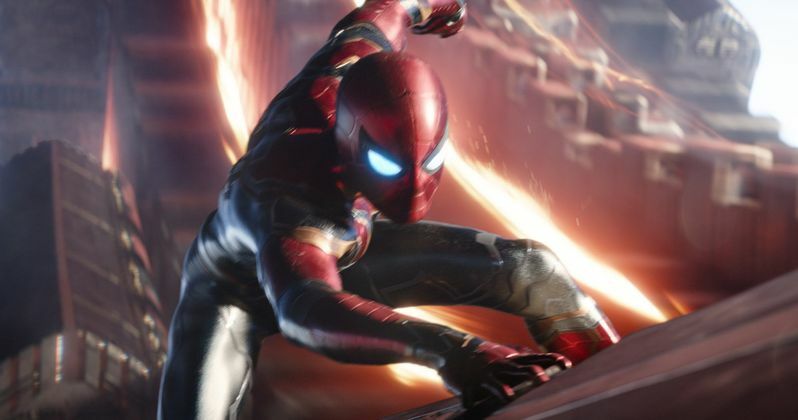 While we still haven't seen enough footage of Avengers: Infinity War to get a clear picture of Spider-Man's mysterious costume change, and probably won't until the Marvel movie's release in late April, it's still an interesting theory to consider. As badly as it may hurt to see our favorite heroes be beaten to a pulp, it would certainly add a lot of drama to the film and keep everyone at the edge of their seats. Avengers: Infinity War releases in theaters everywhere April 27.